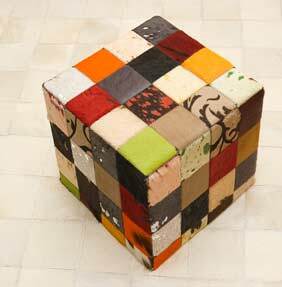 Our collection of patchwork leather poufs and cushions are all made from the finest cowhides of Northern France. They are all cut and hand-stitched in Spain before been shipped all over the world. Choose from a wide range of designs such as, Zebra, Multi Colour Patchwork, Stripes and Cowhide. All cushions feature leather one side, the poufs are leather on all sides. Please note these are natural products and no two will be exactly the same, they will be very close but not exact.